DATE/TIME: Wednesday, February 6, 10-11 a.m.
“We’ll be delivering letters to MLA offices across the province to send a message to the BC government: immediate, decisive action must be taken to enact a moratorium on old-growth logging in critical hotspots like the Central Walbran. Protection for Vancouver Island’s last ancient rainforests must be combined with strong support for First Nations and good long term forestry jobs.” Events are also happening in Langford, Vancouver, and Nanaimo. Go here for more information. This blog has reported on Father Charles Brandt before. 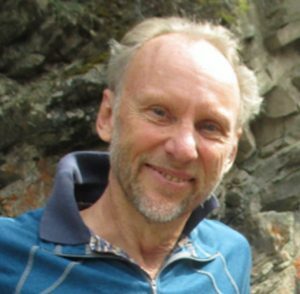 Now, “The Comox Valley Land Trust (CVLT) is pleased to announce the establishment of a conservation covenant over 27-acres of wild land on the banks of the Oyster River. The land is currently home to spiritual leader and conservationist Father Charles Brandt, 95, who asked the CVLT to protect the mature forest and riparian areas for future generations.” Read more. Also see this profile in Decafnation. NIPR Greens have a Team Green. Help to support our efforts, or just provide words of support and encouragement here. One of NIPR’s members has worked with the local organizers to get them to use compostable cups/spoons this year, so all that styrofoam won’t have to go to the landfill. One of our team will be monitoring the recycling, to make sure things go in the right bucket. “At the beginning of the waste audit, there was 8.7 kg of trash, but after separating out the compostable, recyclable and reusable items, they reduced the amount headed to the landfill to 1 kg. ‘It’s gross,’ said grade 5 student Kira, adding she was surprised by how much shouldn’t be thrown in the garbage.” If only ALL schools would do this with their students! Read more. In case anyone here wants to present the idea to their local schools, here’s a handy pdf on how to do it. Marine Harvest is now called Mowi Canada West. From their website: “Mowi is proud to be leading the Blue Revolution in beautiful British Columbia. Providing high quality jobs growing our fantastic, healthy salmon.” Given videos we’ve seen about the “fantastic, healthy salmon” in the fish farms, that’s maybe a bit rich. A January 24, 2019, letter to the editor in the Comox Valley Record has sparked a huge number of comments online. The writer is a global warming denier, claiming it’s all a hoax. What’s more interesting than the letter itself is the number of comments this generated, and a “frank” debate. I bet the Record doesn’t see that too often. “With how Indigenous education is growing we wanted to make it an inclusive opportunity for everybody at the school,” said Danna Pattinson, an Indigenous support worker at Puntledge Elementary.” Puntledge Park school has an Elder in Residence. Read more and watch the video that’s included. Part 1: Last week we told you Andrew Gage from West Coast Environmental Law would be presenting to the Courtenay Council on the municipality sending a climate letter to the 20 largest, global fossil fuel companies. Read this article in Decafnation on that presentation. “The conservative think tank Competitive Enterprise Institute has been busily pressing forward with its mission to promote climate denial, using high-profile tactics…[and] also working behind the scenes, filing records requests…for information from cities filing climate liability suits and academics studying the topic…An ethics complaint filed by another fossil fuel industry-backed group in December against then-New York Attorney General Barbara Underwood echoes a report written by CEI legal fellow Chris Horner. The report relied on public records requests to allege that attorneys general are involved in a coordinated scheme by private interests to hold oil giants responsible for climate change. That alleged conspiracy includes Massachusetts Attorney General Maura Healey, who is also investigating Exxon for possible fraud. Horner has also filed information requests with municipalities filing suit against the oil and gas industry…. In those requests, he is seeking records related to a climate litigation-related briefing he said took place at Harvard in 2016….In July, he requested communication belonging to staff members in the Rhode Island attorney general’s office, after it became the first U.S. state to attempt to hold the fossil fuel industry accountable for climate change by filing suit against 21 oil and gas companies.” Read more. “A subsidiary of Calgary-based energy company TransCanada bulldozed through traplines and personal property from two different clans of the Wet’suwet’en Nation last week, while the RCMP enforced an interim injunction requested by the company so that it could proceed with construction. Some Wet’suwet’en members said the RCMP illegally prevented them from entering their own territories, violating the nation’s rights.” Read more. January 30, 2019 – The Office of the Wet’suwet’en has written to B.C Minister of Environment George Heyman to request an immediate cease-and-desist work order for Coastal GasLink pipeline project on Wet’suwet’en territories. Read more. Also APTN News carried this story. “Michelle Mungall’s constituency office on Sinixt territory was occupied today, January 30th, 2019 at 11am. People acting in solidarity refused to leave until she agreed to meet in person with her local constituents (Nelson-Creston area) to hold her accountable to her actions as Minister of Petroleum, Energy and Mining. A meeting has been secured for Monday, February 4th on Sinixt territory.” Read more. “The company has brought in RBC Capital Markets to manage the sale, and members of the First Nations LNG Alliance are expressing interest in buying in. The Globe reports that TransCanada “declined on Monday to explain its motivation, but the move aligns with the company’s shifting focus away from Canada and the possibility that First Nations could buy into the pipeline project and help overcome construction delays.” Read more. The Heiltsuk First Nation on British Columbia’s central coast have created a virtual tour of Húyat, one of the many culturally important places within their homeland. Also watch/listen to the short video. The headline says it all. At least we won’t have to have a provincial AND a federal campaign in the same year. Read more. NIPR has THREE candidate nominees! Yes, that’s right! Nominations are closed and three brave people have stepped forward to be the candidate. This is a rare occurrence in the Green Party in general, and a first for NIPR. Also mark your calendar now for the Nomination Meeting, where you get to vote for who will become YOUR 2019 GPC candidate. The meeting will be on March 10, 2019, probably at 2 pm, and will be held simultaneously on Vancouver Island and in Powell River. You must be a GPC member in good standing for 30 days, so that means you must get your membership by February 8, 2019, in order to vote for the candidate on March 9. This blog has previously reported on Bill C-69. As a refresher, watch Elizabeth May in Parliament on this legislation. The Conservatives are now wanting consultations with Canadians. Read more. China reacts to U.S. indictments against Huawei. How will it impact Canada? Power & Politics has analysis and insights. Plus: Elizabeth May on C-69 concerns. Listen here. The Green Party says when it comes to carbon, its economic position is keeping good company. “What do Elizabeth May and the Green Party of Canada have in common with 27 Nobel economics laureates, all four living former chairs of the Federal Reserve, 15 former chairmen of the president’s Council of Economic Advisers, and two former Treasury secretaries,” a news release Friday morning asked. “They all agree we need carbon pricing and that we need it now.” Read more. Friends of the Earth has been trying to get Health Canada to review Roundup for quite a while. Read more. Now they’ve brought the lawyers who proved Monsanto causes cancer to Canada. Read more about that event here. “There’s a smear campaign being run by big oil and their cheerleaders. They’re trying to delegitimize and demonize Canadian environmental groups for taking U.S. money. It’s a red herring. And so are their other arguments against climate action.” Read more. This is an exciting find, though it seems to be from 2016. Their mission is to mobilize “1,000,000 Canadian youth (that’s 3% of Canada) with one goal: to educate and empower us to plan and take action towards climate change solutions in local communities.” Read more and watch their video. “In the face of climate catastrophe, we see young people from across this land coming together, time and again, to work for the just and livable future we know is possible. Powershift: Young and Rising will galvanize a new wave of young leaders to assert a vision beyond fossil fuels- one that honours the leadership that frontline and Indigenous communities have been taking for generations. From February 14-18, 2019 in Ottawa, on the land of the Algonquin Anishinabe, PowerShift: Young and Rising will convene hundreds of young people from across Turtle Island. This four-day climate convergence will feature workshops, keynote speakers, performances and panel discussions on how we– as a collective movement of young people– can take action to solve the climate crisis.” Check them out here. Well, that should put some people back to work in Alberta! Read more. And here is the Green Party of Alberta’s response to the ruling. This CBC piece gives a little more context to the reality. “Five years ago, the Orphan Well Association (OWA), the industry-funded organization that cleans up orphan wells, said there were less than 200 wells to be reclaimed. As of this week, there are 3,127 wells that need to be plugged or abandoned, and a further 1,553 sites that have been abandoned but still need to be reclaimed. There are nearly 90,000 inactive wells across the province.” (Emphasis added) In light of the more than 1500% increase in the number of wells, “Brad Herald, vice-president of Western Canada operations at CAPP, can see progress.” It’s hard to see what the progress has been. CBC’s The National spoke to an Alberta farmer whose property is being ‘reclaimed’ for a while now. He has planted some seeds in a couple of the ‘reclaimed’ areas, and so far nothing will grow. A Canadian forestry company, Resolute Forest Products, has lost most of a lawsuit against environmental groups in the U.S.
“A Montreal-based forestry company has had most of its lawsuit against a group of environmental organizations dismissed by a California judge. The suit was brought by Resolute Forest Products against Greenpeace, Stand.Earth and several individuals. The company says the environmentalists defamed it by saying, among other things, that it was harvesting in an area of Quebec it wasn’t. Resolute also brought racketeering charges against the groups. But the judge dismissed most of those claims, including the racketeering charges. He found Resolute’s suit to be an attempt to stifle criticism of the company’s actions.” There’s very little coverage of this. Why didn’t it make more news? Read more. Here’s a bit of good news: More consumers are sending a message with their purchasing decisions. Excerpt: “Consumers are attracted to organizations that are committed to using good quality ingredients (83 per cent), treat employees well (66 per cent), and believe in reducing plastics and improving the environment (58 per cent),” Accenture said in a statement…But maybe more importantly, it suggests that businesses that aren’t “purpose-led,” as the Accenture survey phrases it, may suffer financially down the road. There’s a “strong correlation” between companies that perform well financially and those that are “checking the box for ethical, sustainable behaviour,” said Kelly Askew, Accenture Canada’s managing director for strategy.” Read more. 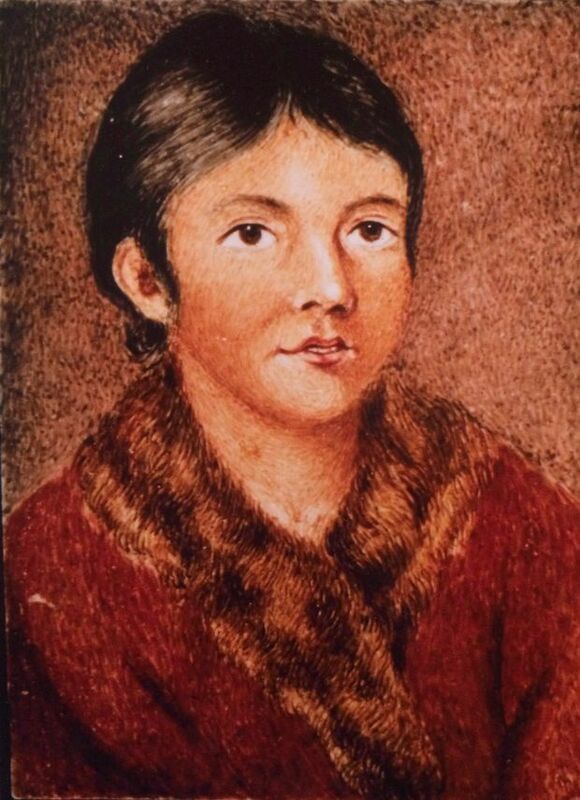 For almost 200 years, the remains of two Beothuk people—Nonosabasut and Demasduit—have resided in a Scottish museum. Now they’re coming home to Newfoundland. (Globe and Mail). 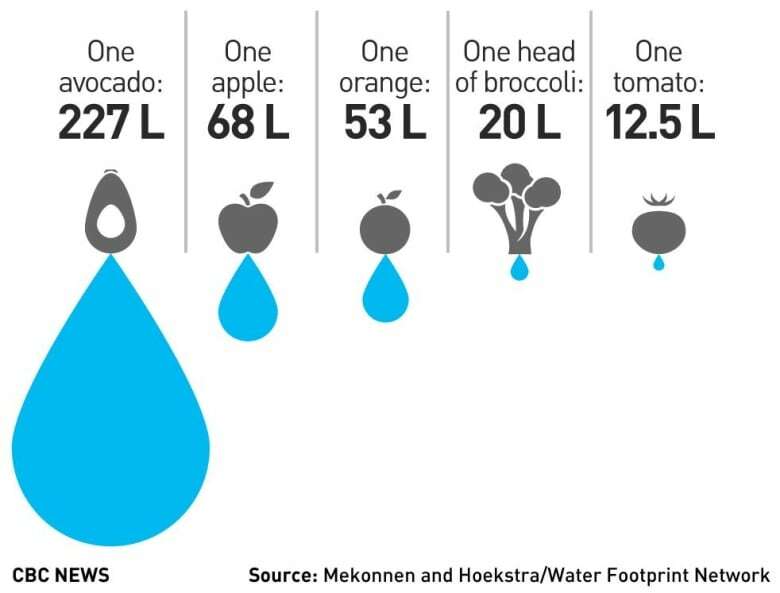 The CBC newsletter, “What on Earth,” profiles the water consumption of produce. If you love avocados, it may be time to rethink them. Read more. Guest submission: “This is the second high-profile review/publication I have read on this BC company which features breakthrough technology that has massive potential to lead us through the transition to low carbon fuels and emissions. It is on the brink of commercialization, relocated to BC because of our carbon tax (i.e., it needs that to compete with petroleum industries). It appears to be the ‘real thing’ and well worth a few minutes of your time to read up on. The company website is well worth reviewing too, especially for an overview of the time, effort, milestones, production and engineering details. Another fascinating Canadian company has been working on injecting CO2 into cement to both increase concrete strength and effectively sequester CO2. This process is being used already, but deployment to large commercial scale might take some time yet, largely for reasons of “acceptance” in the industry. Read this article about it. If you aren’t familiar with this website, check it out. They have great, inspiring stories from around the world in their newsletter. There are probably many climate deniers who are using the current polar vortex that is crippling much of Canada and the US, and is causing multiple deaths, as ‘proof’ that global warming is a hoax. Read more.